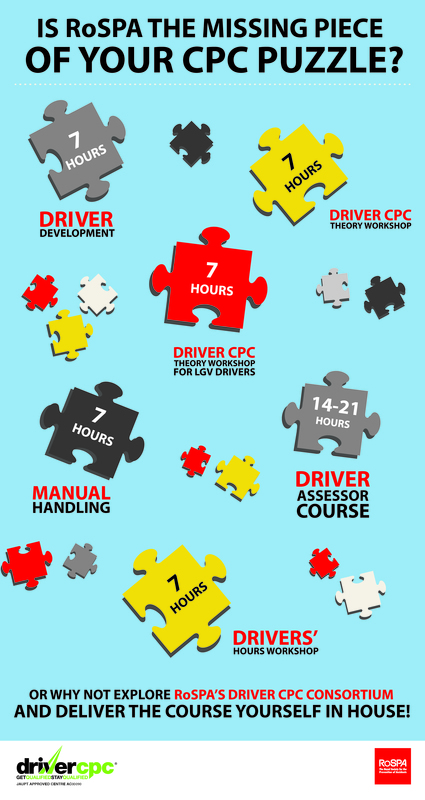 The good news is that it’s easier than you think to complete the 35 hours of certified training required for your CPC driving qualification (sometimes called DCPC). For instance, as an approved JAUPT centre, RoSPA is able to provide driver development training for bus, coach and large goods drivers which includes key defensive driving techniques and much more. Alternatively, you could use our consortium service to provide in-house driver CPC training, meaning CPC licence costs for your organisation will be even lower. Below we have provided a simple infographic to illustrate just how easy it is to achieve 35 hours – so there’s no need to be ‘puzzled’ anymore!